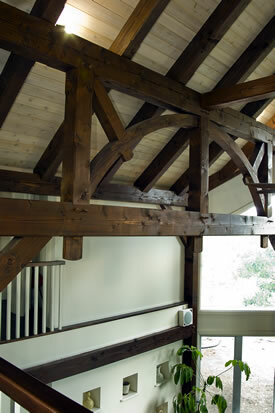 As a timber frame specialist, Len Kuipers Homes designs and installs timber frame structures. Whether adding a decorative element such as a timber frame entranceway to your home, or deciding on a full timber frame structure, timber frame adds a dimension of beauty and elegance unmatched by manufactured materials. As a timber frame specialist, whether you have finalized architectural plans or just starting to put ideas to paper, we can supply and install a timber frame to suit any home design. Timber frame homes - we can make it happen!